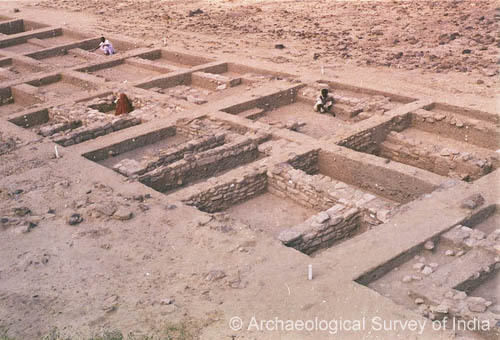 Being one among the five largest Harappan cities in the subcontinent, Dholavira has yielded many firsts in respect of Indus civilization. Fourteen field seasons of excavation through an enormous deposit caused by the successive settlements at the site for over 1500 years during all through the 3rd millennium and unto the middle of the 2nd millennium BC have revealed seven significant cultural stages documenting the rise and fall of the Indus civilization in addition to bringing to light a major, a model city which is remarkable for its exquisite planning, monumental structures, aesthetic architecture, amazing water harvesting system and a variety in funerary architecture. It also enjoys the unique distinction of yielding an inscription made up of ten large-sized signs of the Indus script and, not less in importance, is the other find of a fragment of a large slab engraved with three large signs. This paper attempts to give an account of hydro-engineering that is manifest in the structures of the Harappans at Dholavira. The ancient site at Dholavira (230 53′ 10″ N; 700 13’E), taluka Bhachau, district Kachchh in state Gujarat, lies in the island of Khadir which, it turn, is surrounded by the salt waste of the Great Rann of Kachchh. The ancient settlement is embraced by two monsoon channels, namely, the Manhar and Mansar. The ruins, including the cemetery covers an area of about 100 hectares half of which is appropriated by the articulately fortified settlement of the Harappans alone. The salient components of the full-grown cityscape consisted of a bipartite ‘citadel’, a ‘middle town’ and a ‘lower town’, two ‘stadia’, an ‘annexe’, a series of reservoirs all set within an enormous fortification running on all four sides. Interestingly, inside the city, too, there was an intricate system of fortifications. The city was, perhaps, configured like a large parallelogram boldly outlined by massive walls with their longer axis being from the east to west. On the bases of their relative location, planning, defences and architecture, the three principal divisions are designed tentatively as ‘citadel’, ‘middle town’, and ‘lower town’. The citadel at Dholavira, unlike its counterparts at Mohenjodaro, Harappa and Kalibangan but like that at Banawali, was laid out in the south of the city area. Like Kalibangan and Surkotada it had two conjoined subdivisions, tentatively christened at Dholavira as ‘castle’ and ‘bailey’, located on the east and west respectively, both are fortified ones. The former is the most zealously guarded by impregnable defences and aesthetically furnished with impressive gates, towers, salients and drainage. To the north of the citadel a broad and long ground, probably used for multiple purposes such as community gathering on festive or ceremonial occasions, a stadium and a marketing place for exchanging merchandise during trading seasons (s). Further north, there was laid out the enwalled middle town while to its east was founded the lower town. The last -mentioned one did not have an appurtenant fortification though, it was set within the general circumvallation. Besides to the south of the castle, across the adjoining reservoir, there was raised another built-up area running along the city wall, perhaps, designated as annexe or a warehouse meant for housing the retainers and menials. 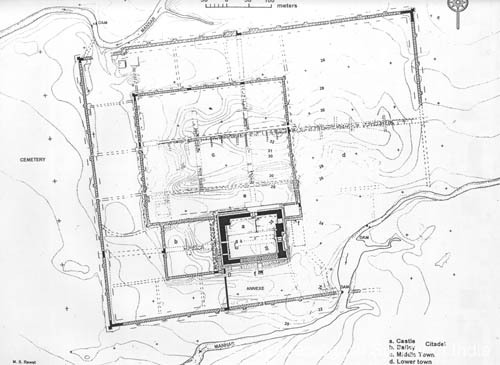 The layout that is briefly described above pertained to the fully-developed form of the Harappan city. There are identified seven major cultural stages, serially numbered from Stage I to Stage VII which document the gradual rise, culmination and fall of the Urban System of the Harappan civilization vis-s-vis the settlement which spread over a time period of one and a half millenniums spanning the whole of the 3rd millennium and half of the following. The first settlement of Stage I was a strong fortress now lying buried in the castle mound. A part of the southern arm of its fortification that was laid bare near the south-western corner measured 11.10 m at the base. It showed tapering sides to an extant height 4 m. The foundation of the planning that was laid in Stage I formed the nucleus on which the subsequent settlements of the later stages expanded gradually. Even the building materials, whether standardized bricks (9 x 8 x 36 cm, ratio 1 : 2 : 4 ) or stone, both undressed and dressed, remained in use, subsequently through Stage V.
In Stage II, a 2.80 m thick brick masonry wall was added to the pre-existing defensive wall from the inner side and the face of it was plastered over with fine paste of white and pink clays at least as many as thirteen times. There is another significant development that took place. A residential area was coming up to the north of the walled settlement. Besides, pottery forms and antiquities diversified as well as increased in both quality and quantity. Stage III, sub-divided into two phases, i.e. IIIA and IIIB, was a most creative and important one in many respects: the southern arm of the antecedent fort-wall was further widened from the inner side with an additional brick-masonry of about 4.5 m and the existing walled settlements was made into a castle and another walled subdivision, arbitrarily called as bailey, was added to it from the west. In the north, the extended residential area of Stage II was cleared of structures for carving out a multipurpose ground. Further north, the extensive walled town (which would become middle town subsequently) was founded. Reservoirs were created on the south, west and north of the built-up divisions on an ostentatious scale and design. And, finally, an outer fortification in order to surround all the components was constructed during this stage. For the first time, three square steatite seals much smaller and lighter and furnished with figures but without inscriptions appeared in addition to a potsherd bearing Indus signs and also a cubical weight. Besides, a good number of classical Harappan pottery forms with painted motifs made their debut. When the town of Stage III had lived two-thirds of its life, it was immensely damaged by a catastrophe. Its tell-tale marks were vividly present in the defensive wall of the castle. Repairs were undertaken, the lower town was added and the city-walls were extended further eastwards in order to enclose the new additions. As a result, the erstwhile town attained full cityscape that dominated the cultural scenario for centuries through Stages IV and V.
Significantly, during the first three stages, i.e., I, II and III, the inhabitants exhibited an abiding preference for colourful clays, e.g., white and pink for plastering nearly all the structures whether defensive walls, roads, streets, ceremonial ground, or the walls and floors of private houses. Even roof tops of the houses might have been treated similarly. But, this tradition came to an abrupt end with the end of Stage IIIB and beginning of Stage IV, as if under a royal decree or by a resolute public consensus. At Stage IIIB, the cityscape had attained its fullest growth. Stage IV belonged to that form of the classical Harappan culture which is so widely familiar with from a large number of excavated sites. Almost all the salient features of the city planning were scrupulously maintained along with the monumental structures such as gateways, fortification, drainage system. The famous ten-signed inscription of unusually large size was surely in use during this stage. All the classical Harappan elements such as pottery, seals, weights, beads, items of gold, silver, copper, ivory, shell, faience, steatite, clay and stones are found in abundance. Stage V is characterized by the general decline particularly in the maintenance of the city. It is more vividly reflected in the citadel. The other items such as pottery, seals, weights, etc., continued in use, however. This stage was followed by a temporary desertion of the site, perhaps not lasting more than a few decades before the Stage VI ushered in. Stage VI presents a state of cultural transformation. New ceramic traditions coming from the sides of Sind, Rajasthan, Gujarat and far-off region in the north made appearance. The one-time city shrank into a smaller town, confined to the citadel and the southern margin of the middle town only although some of the existing fortification walls were kept in use, a new wall of different construction was raised on the north for delimiting the settlement. The classical planning was largely given a go-by. Domestic buildings were laid out in a different planning. Bricks were no longer in use. While many of the pottery forms and decorative motifs were still in vogue, new ceramics in the form of white painted black-and-red and white painted grey wares along with a coarse ware bearing incised or appliqué or both kinds of designs and also some Bara related pottery made their appearance. Many other traditional items continued in use though the seals underwent a change. Rather being square in form, those were long rectangular with a flat or triangular back with a hole for string. The seals still bore nicely cut inscriptions but no figures. Stone cubical weights were still in vogue in addition to similar ones cut out of potsherds. Overall picture that is projected is that impoverishment and rapidly crumbling urbanism. Having lived there for about a century, the late Harappans of Stage VI abandoned the settlement. The desertion that followed was certainly a longer one. How long? It is not certain at present. The new comers of Stage VII had forgotten the classical Harappan fabrics, shapes and designs. Strangely enough, the newcomers built their houses in an entirely new form that was circular. No planning as such is discernible. All the urban attributes became conspicuous by their absence. Thus the urbanization that made its humble beginnings in stage I and went on progressing through Stages II, III and IV, started decaying in Stage V and underwent a transformation in Stage VI with a feeble revival only to become totally deurbanised in Stage VII. The site was never occupied thereafter. Lying between the monsoon channels and being undulating sloping towards the south, the site was ideally suited for a settlement having artificial dams and reservoirs. The above table inter alia reveals the proportional relationship between the castle and the city so it does in respect of intra-divisional and inter-divisional measurements. It is interesting to give another illustration: the diagonal drawn between the two opposite angles made by the north-eastern and the south-western corners of the city touched the north-western corner of the castle. While of the remaining two, the south-eastern corner is still missing, or not found out, a line, therefore bisecting the north-western angle also bisected the north-western corner of the middle town and further on cut across a crossing of four streets and finally the north-eastern corner of the castle. This could have been achieved by precise mathematical calculations and drawings which were then translated on the ground that was undulating by 13 m in gradient. It was indeed a great engineering achievement. In the whole scheme, the enwalled area of the castle became 49th (7 X 7) part of the city while its total built-up area was 25th (5 X 5) part. Furthermore, it is very significant that the two-thirds of the middle town and the whole of lower town were planned with bold projections and recesses just like those one finds in the layout of an Indian temple of the later ages. As a result, the city divisions were provided with a number of housing sectors and spaces. Some of latter were found to have been used for dumping domestic refuse. Another significant feature is the arterial street that ran across axially from west to east dividing all the above-mentioned units and sub-units into two equal halves, and a north-south street, perhaps somewhat staggered, further subdivided each unit. The lower town, too, was resolved into several units. Each unit seems to be having likewise projections and recesses and in turn demarcating an opens pace, of course. The arterial street of the middle town passed through a gate in eastern fortification wall and then went on running across the lower town albeit with a few turns, each at the end of a residential sector. The street however remained uninterrupted. Other major and minor streets and lanes shot off from the axial street for making a defined network of housing sectors. Seventeen gates, all built in the fortification walls with equally interesting add-on components, have been exposed so far. Their number-wise break up is: cattle 5, bailey 2, stadiums 4, middle town 1, annexe 2 and the remaining 3 belonging to the late Harappans of Stage VI. Being fairly much preserved, those bear immense archaeological and architectural significance interestingly, each castle gate is designed differently. Four of them, constructed somewhat, if not precisely, in the centre of each arm of the fortification, were regular gates while the fifth as an additional one in the eastern wall served some specific purpose as the flight of its broad steps stopped just halfway down from the top and did not descend onto the ground outside. The south gate was a concealed passageway leading one through open stairs to an exquisite rock cut reservoir. The remaining three, one each on east, west and north, shared a few common features which comprised besides broad and deep passageway and stairs, a high front terrace and a connected pathway with outward gentle slope. All these were duly provided with in the west gate. There the similarity ended. The east gate was more elaborate with a built-in chamber, large and elevated above the sunken passageway which in turn was connected to stairs rising onto the interior of the castle. The north gate was however the most elaborate and the most elegant and imposing on a vantage location commanding over sprawling cityscape and enchanting landscape. It had two large and elevated chambers flanking the sunken passageway which in turn was connected to an L-shaped staircase ascending from the inner end. Its lofty front terrace, 6m high and 12m deep, was connected to an equally broad pathway with a slope towards the east where it terminated separately onto the little as well as great stadium. The north gate is also remarkable for yielding a spectacularly large inscription made up of 10 unusually big Harappan letters which were surely inlaid on a wooden board since decayed but fairly determinable for its size and shape which matched well with the width of the doorsill of the gate and suggesting thereby that it was originally sported on the façade, right above the door of the gate so as to be visible from afar for its white brilliance. Of very special should also be the pillars and the pilasters which adorned the interior of the chambers of both east and west gates. Those were mounted on the side walls of chambers for giving support to the respective roofs as well. Each wall had a central pillar and a pilaster at either end, mow represented by their lower members as those were composite ones. These members were skillfully sculpted and smoothened out of bright yellow or banded limestone that was quarried 2.5 km. from the side. Each pilaster has a long basal slab supporting a set of rectangular blocks on what rested the superstructure made of mud concrete bricks, which was most likely encased with three wooden planks with their tongues being close fit into grooves that were cut on each top block while the third plank, was, perhaps, fixed into the other two by side angle joints. Likewise the central pillar, too, has a basal slab supporting a set of square blocks followed by a beautifully carved circular member with concave profile and flattened bottom and top surface. While all those were in situ, there were also found two dislodged ones, both having convex profile as well as tenon hole provision on either flat surface of each. Plausibly, the shaft of the column was wooden one. Contrarily, the central pillar of the western chamber of the north gate was found missing to be represented now by a robber’s pit. The corresponding one is the other chamber also suffered from vandalism that was certainly wrought by the late Harappans. Luckily, all its members, which were met with the east gate, were found there although lying topsy-turvy in the pit that was caused right under the precise location of the pillar. In all, certainly in the north gate, there was a door with double leaves within a massive frame with a sill of limestone at either end of the deep passageway. At each end, there were, perhaps, two doors, one above another as this gate seems to be a double-storied construction with a possibility of a continuous wooden floor running wall-to-wall all over across the chambers and above the sunken passage so as to make a large magestic hall decorated with aesthetic pillars and pilasters and approachable from the rear side, besides the staircase. We may not be elaborating on the other gates in the city. However, the east gate of the great stadium and the similarly located gate of the middle town, both intercommunicating with the lower town, were also quite elaborate and impressive. Significantly, the west gate of the same stadium was connected with a long and broad corridor with a storm water drain running underneath. The late Harappans gate openings were simple and unpretentious. They were also however using many a Harappan gates. Very likely, the north gate and also the east gate inter alia served the purpose of royal procession on occasions and the little stadium had a role in that too. Mohenjodaro and Kalibangan have open space between citadel and lower town. At Harappa and Rakhigarhi, it lies to the east of citadel and north of lower town. Archaeologically speaking, no convincing proof of use(s) of such space has been put forward so far. Now, Dholavira can claim a solution to the riddle. It has shown up two such open grounds which should have been put to multipurpose uses such as community gathering on festive or special occasions, royal ceremonies, sports and entertainment and commercial activities during trading season. Propositions are based on their location, architectural specialties and antiquarian tidbits that were found in course of excavation. There are two such closed arenas. One, lying between citadel and middle town and being provided with two major gates, one on each on east and west, measured 283 m E-W and 45 to 47m N.S (ratio 6:1). It was also furnished with tiered, stepped or sloping stands on all four sides. For convenience, we may refer it as stadium or rather the great stadiums while the other one, far smaller is called the little stadium. The latter that was separated by massive stand from, but connected through an opening to, the former, lay right under the shadow of the pre-eminent castle onto which it abutted at the north-western corner. Both the stadia should have been used for some common as well as some separate function. To conclude, we may add that the great stadium is perhaps the largest in length while both are the earliest so far as archaeology has evidenced. 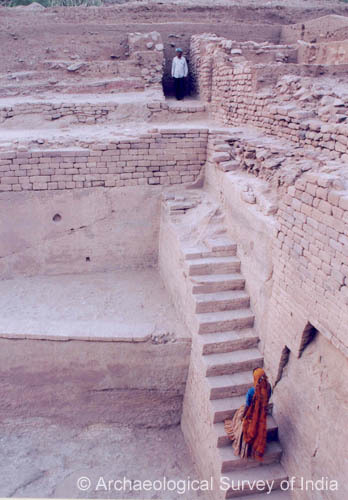 The other area in which the Harappans of Dholavira excelled spectacularly pertained to water harvesting with the aid of dams, drain, reservoirs and storm water management which eloquently speak of tremendous engineering skill of the builders. Equally important is the fact that all those features were integrated part of city planning and were surely the beauty aids, too, The Harappans created about sixteen or more reservoir of varying sizes and designs and arranged them in a series practically on all four sides. A cursory estimate indicates that the water structures and relevant and related activities accounts for 10 hectares of area, in other words 10% of the total area that the city appropriated within its outer fortification. The 13 m of gradient between high and low areas from east to west within the walls was ideally suited for creating cascading reservoirs which were separated from each other by enormous and broad bunds and yet connected through feeding drains. Six of the water tanks, one to east of castle and five of the series to south of it, have been fully or considerably exposed while a few others or other related features are testified in check digs. It was found to be the largest, grandest and best-furnished reservoir of rectangular shape measuring 73.40 m N-S and 29.30 m E-W (ratio 5:2) at the top while above that there should have been a 1 to 1.20 m high embankment as evidenced at four corners. Its floor was excavated into three levels the deepest of which was 10.60 m as has been ascertained so far. 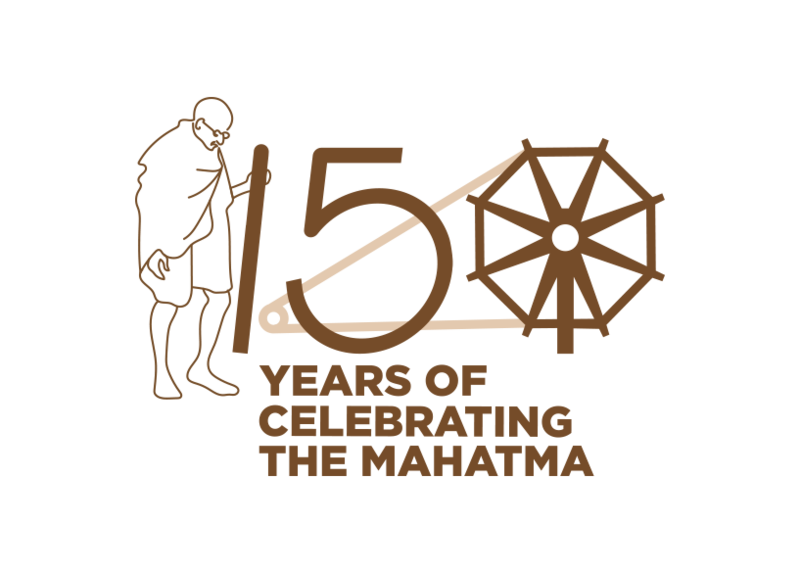 At three corners, the north-western, north-eastern and south-western, it was provided with a flight of 30 steps each while at the fourth, there should be a waste-weir that still remains to be determined by more excavation. While the embankment served as a broad walkway on two sides, it was found to be a part of a wide causeway connecting it to the entrance appurtenances of the castle and, on the west, it should be flush with a 20 to 22 m promenade that lay between the castle wall and the reservoir. Inside the water structure there was found a rock cut well with a few rock cut steps and a stone-made enclosure of a later date. It is well-nigh presumable that some kind of tank was there right from Stage I. It should have been elaborated during Stage III. The present one was certainly a creation of Stage IV while during Stage V, it got damaged beyond repairs by the authorities – that, it become defunct forever. One thing is certain that it was accessible to all the city-dwellers whether living in citadel, middle town or lower town or even outsiders. Besides, it was, perhaps, by all on some social or religious occasions. It may also be added that it was created by partly excavated through the alluvium and partly by cutting the underlying rock and also that it was fed with the water from the Manhar largely. Another five making a series outside along the south of the citadel have excavated fully or partly. These are of varying sizes and depth were cut into soft sedimentary sandy limestone and make two mega-units with a somewhat staggered disposition. The first two from the east form one unit and the rest the second centrally located tank exhibit genuinely a rock cut architecture of excellence both in beauty and skill and also surely in importance and use. Consisting of both inlying and outlying features, it has a deep basin, an obliquely oriented deeper trough inside, a surrounding freeboard, two masonry flight of steps, an inlet and another rock cut outlet channel, besides outside features like a wide terrace on the west, a massive levee on the east, a stairway ascending to the covered south gate of the castle, a working platform on the south, a passageway between walls, emanating from the north-eastern stairs. Running parallel to the defensive walls of the castle as well as the city, it is rectangular tank measuring 33.4 E-W and 8.90 to 9.45 m N-S while the upper lies at the depth of 5.90 m to 6.50 m and the lower one at 7.90 m below the ancient working level. In fact, the deeper level pertains to the trough that was cut in the eastern half of the general basin. It has measured 15.50 m long E-W and 5.65 m acoss with its vertical sides being 140 oblique to those of the main basin. The neatness with what the tank was cut is remarkable. The weaker veins of the rock were scooped out and plugged with superb masonry work. The remaining two rock cut tanks lay further west. All the tanks were interconnected with drain conducting water into each other. The surplus water finally flowed out through a masonry drain into another series of reservoirs excavated further west. All these reservoirs like the eastern one became defunct sometime during Stage V.
The citadel has yielded an intricate network of storm water drains, all connected to an arterial one and furnished with slopes, steps, cascades, manholes (air ducts / water relief ducts), paved flooring and capstones. The main drains were high enough for a tall man to walk through easily. The rainwater collected through these drains was stored in yet another reservoir that was carved out in the western half of the bailey. Besides, the city has yielded toilets, sullage jars, or sanitary pits. Drains have shown a good variety even included cut-stone ones and pottery pipes. Like many amazing elements that Dholavira has yielded in respect of Indus civilization, another aspect of sepulchral architecture. The cemetery lies to the west of the city and covers a very large area. There are found a variety of cenotaphs which include regular rectangular and circular structures. So far as orientation is concerned, besides north – south, or northeast – southwest oriented structures, there are many which are east – west in longer axis which is certainly not Harappan in character. The most interesting are seven hemispherical constructions two of which were subjected to excavations. These were huge mud brick structures, having a circular plan and hemispherical elevation. While one was designed in the form of a spoked wheel, the other was without spokes. Both the structures were made over rock-cut chambers of large dimensions. Primarily, all sepulchral structures are devoid of skeletons although in most cases, they are furnished with grave goods mainly in the form of pottery. One of the hemispherical structures which has been exposed much, has yielded a necklace of steatite beads strung in a copper wire with a hook at either end, a gold bangle, beads in gold foil and other beads, besides specially made pottery. The hemispherical structures remind one of early Buddhist stupas. The kind of design that is of spoked wheel and unspoked wheel also remind one of the Sara-rata-chakra-citi and sapradhi-rata-chakra-citi mentioned in the Śatapatha Brahmana and Sulba-sutras. However, there is a solitary example of a grave with skeleton, with a copper mirror in it. Among smaller graves, there are cists, or cist in a cairn circle, or a circle or half-circle containing number of grave structures. Surely, the Harappans had a composite society having different ethnic / tribal communities following their own practices. 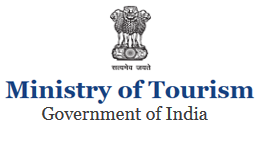 Dholavira has indeed added new dimensions to personality of Indus civilization and hold promise of yielding more given to more exposure sometime in the future.